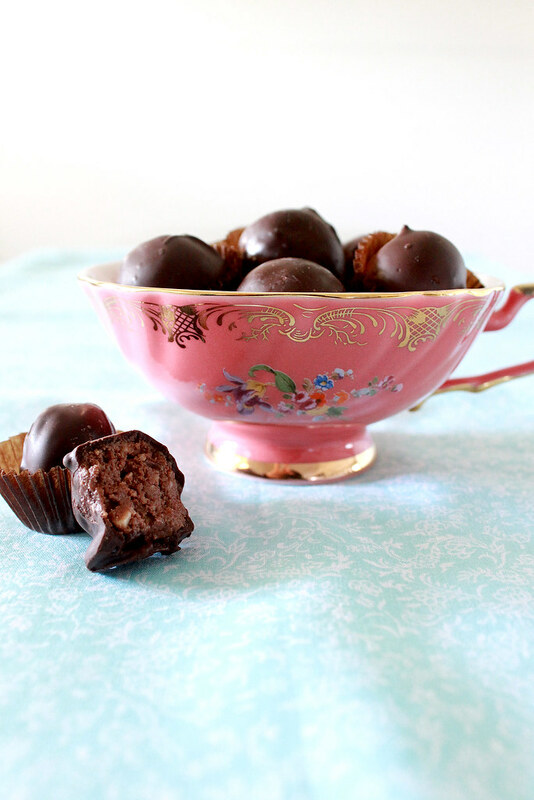 I promised my sister a while back that I'd post the recipe for these super easy & yummy chocolate balls. But the thing is, I don't have the recipe for it. Oh, no. Not everything in life comes with a manual, you know. What I can do is tell you the ingredients and how I made them. Deal? Then, crush some of your favourite nuts in a food processor. You'll need a couple spoonfuls of nutella to combine the crushed biscuits and nuts together in a bowl. Use just enough so that you can roll it into small balls (around 1 inch). Once you've done that, dip each of the balls in melted dark chocolate combined with a bit of copha for a thin consistency. Then, let the ball harden in a small paper cup. Do the same with the rest. 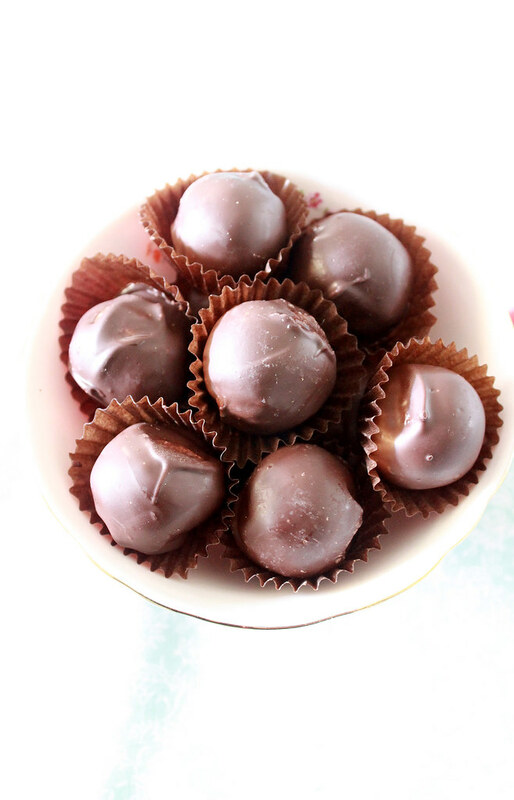 If the weather is warm, put the chocolate balls in the fridge for 5-10minutes. Chocolate balls can be eaten straight away or be kept in the fridge for 2 weeks (estimation). Although, they are best consumed as soon as you've made them. Photos courtesy of Iva Izman. The Man tore his pants. Don't ask me where and how. That's why lately we've been searching high and low for a new pair of pants. I bet you're wondering what we are doing in this shoe store if we are looking for men's clothes. Didn't you know women have a secret motive too? I was keeping an eye out for other things. he he. Is that a good lookin' or funny lookin' lamp shade? Guess what the silver stiletto is meant to be. That's right, a door handle. Trés cool. A real swing set inside a store. The mannequins must be having fun. For all the converse fans. we, down under, are melting away under the scorching sun. Say hello to Summer days in Melbourne. Thirty degrees in Australia is nothing like thirty degrees in a tropical country. Here, you burn more than you sweat. And the air is dry, not humid. The best thing to do in this high heat is to cool down. Cold drinks work wonders. Smoothies are so refreshing and it makes you feel good. The fan and cooler help, too. Eating Gelati is a must. My favourite place to go for gelati is Il Dolce Freddo (The Cold Sweet ~ literally translates to The Sweet Cold) on Lygon. There are many more gelati bar on the same strip but this one will always be my number one. Gelatissimo not far down is also another crowd favourite. All of their gelati are made on premises daily. It was packed that night we came. Most of them were Asians, including myself. It's probably because of the different varieties of tropical flavours they have available. I spot lychees and durian at the end! The green one on the left is green tea. This is one of two display cabinets. Chocolate, Mars Bars or Snickers (I can't remember) and Ferrero Rocher.What a tease. I'm usually a chocolate/nuts/dairy lover. However, this time I felt like more fruity flavours. I chose this berry one and pandan/coconut next to it. We also decided to go with Black Sesame Seed (brown gelati on the left). But it's nothing special. Will make a note not to get it next time. The Pandan/Coconut gelati won me over. But no matter how good they taste, I'll always be an ice-cream fan. We went for a walk towards a park with a spoon each in our hands. By the time we got to the park we've already devoured our cup full. Girls just like to have fun. 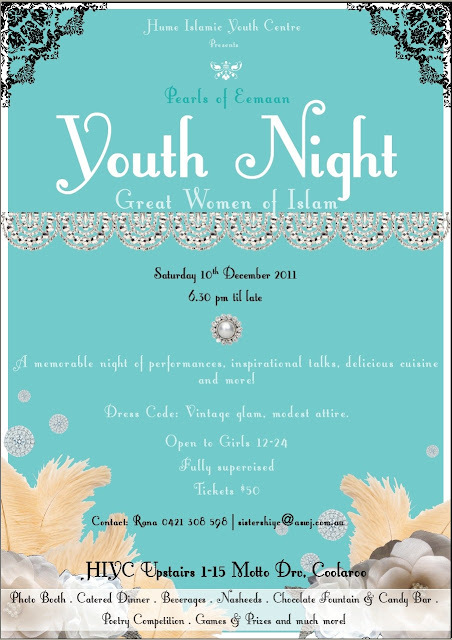 Which is why the 'Pearls of Emaan' Sisters Youth Committee on behalf of HIYC gave it their all to organise an annual event for us ladies - well, "young" ladies. 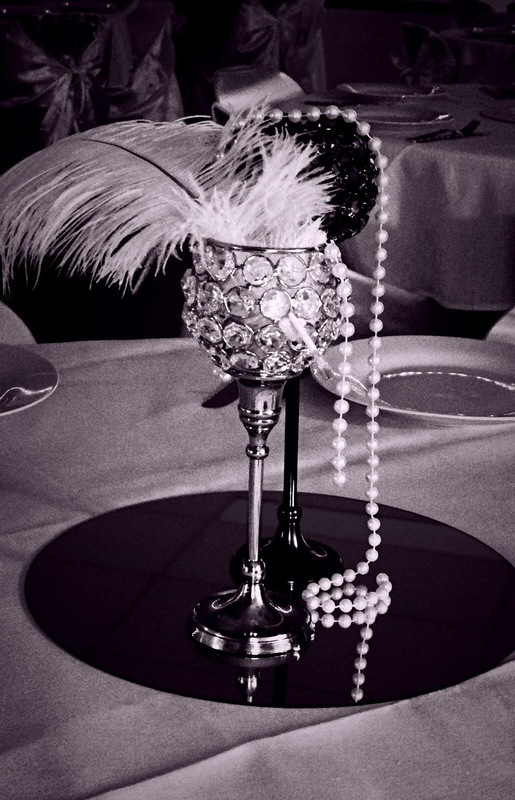 This year's theme was Vintage Glam. A huge applause to the sisters for their hard work. 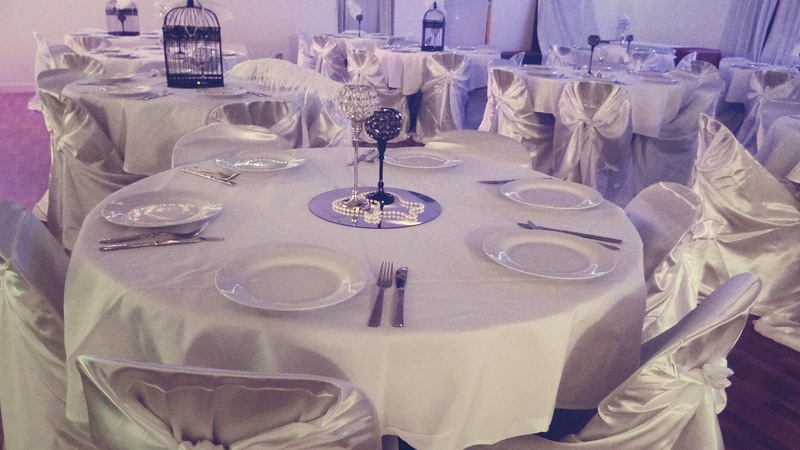 The centrepiece and décor fit into the theme beautifully. The table setting looks like a wedding reception. Gorgeous. 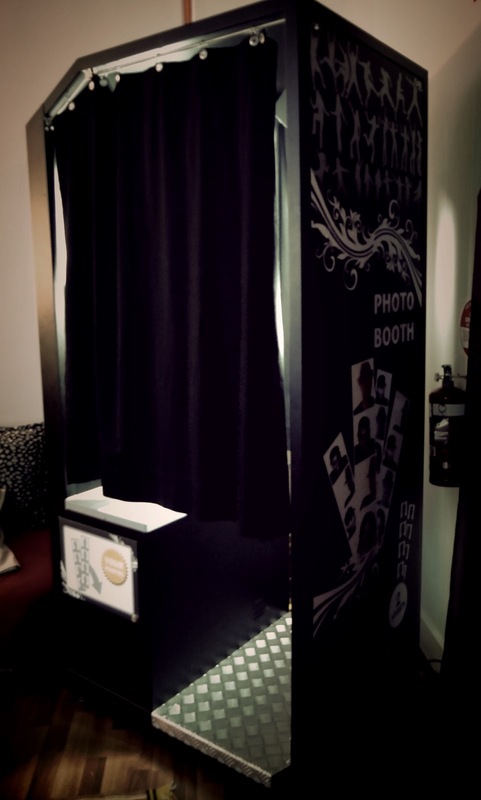 The photo booth was the highlight of the night for many of us. I got my turn, twice. Definitely keeping the photos for memories. Strawberries for the chocolate fountain. Initially, I wasn't planning on attending the youth night as I was sitting the 'Heart Therapy' course by AlKauthar that weekend. The lecture was meant to conclude at 7.30pm and by the time it takes me to get here, I would have been very late. However, for some reason the lecturer let us off one hour earlier on both days which meant that I could still very well make it. Yee ha. I didn't have time to go home so I turned up undressed. It's amazing how things turn out even better than we expect when our own plans fall through. Like my idea of putting chocolate butterflies on the cupcakes to coincide with the "Vintage" theme. The weather had a mind of its own. Within 10 minutes of putting a few of these babies on the cupcakes, it started melting and with just one touch the wing would fall off. There goes my idea of butterfly cupcakes down the drain. They're sitting in my fridge for it's next purpose, a weather friendly event. That's alright. Apparently, they look better without the butterflies anyway! 2. Sieve together flour, bicarb soda, baking powder, salt and cocoa powder in a large bowl. Repeat 3 times. 3. Then add milk, oil and hot coffee into the dry ingredients above. 4. Using an electric mixer, beat on low until combined. 5. Add eggs one at a time and and vanilla essence. Beat again on low for 1 minute. 6. Pour into cupcake liners about 2/3rds full. 7. Bake for 23 minutes or/until skewer comes out clean. 8. Leave to cool on wire rack. 1. Bring cream to the boil in a small saucepan; remove from heat. When bubbles subside, add chocolate; stir until smooth. 2. Leave to cool. To quicken the process, put it in the fridge for 30 minutes or until mixture is no longer runny. 3. Beat the cooled mixture in a small bowl with an electric mixer until light and fluffy. I've been in a cupcake fever for the last two weeks. It was cupcake this, cupcake that, cupcake cupcake cupcake! I told the Man that I needed a break from baking...for a couple of days. he he. After hours of baking and stressing about timing and everything else, my kitchen was a mess. Chocolate and icing on the bench. on chairs. on my clothes. on the floor. No joke. Sigh...it's all for the love of cupcakes. 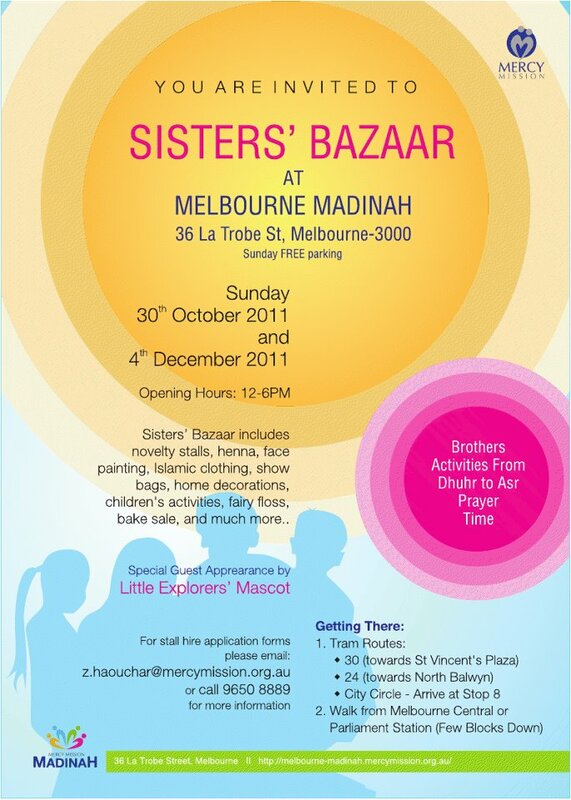 Recently, I held a bake stall at Melbourne Madinah's sister's bazaar just for fun. Yes, for fun believe it or not. I made six different flavours. Slurp. I was located in the food hall along with other mouthwatering sweets and hot foods. Pastries included sausage roll, pies, samosas, lebanese bread (manaeesh) and hot dawgs. This popcorn machine is very dangerous. It has triggered fire alarms and tempted so many, including myself. Zeina's famous tiramisu. Tiramisu literally means 'pick me up'. You want to pick it up right now, don't you? I was told this is a Turkish sweet drenched in syrup. No idea what it's called but they look like mini churros. And finally, the must-have-dessert at every event. Chocolate fountain, strawberries and marshmallows. I didn't have time to take photos of the rest of the bazaar but you can view them here on Facebook. 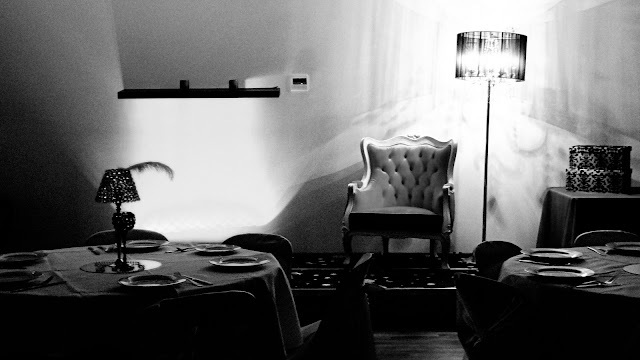 One of my favourite stalls would have to be Casablanca. Her perfumes are amazing, mashaAllah. If I had the money, I would buy almost all of her products. What's even more fantastic is that they are made with pure oil with not a single trace of alcohol. She sells both male and female scents, inspired by popular brands/perfumes in the market. Unfortunately, at the moment she does not have her own store to showcase her products, hence, she is often around markets/bazaars. Insha'Allah one day her products will be more accessible for us all. 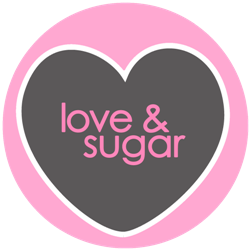 I couldn't believe that some people thought that I actually run my own cupcake business (wow!) and asked if I take orders. 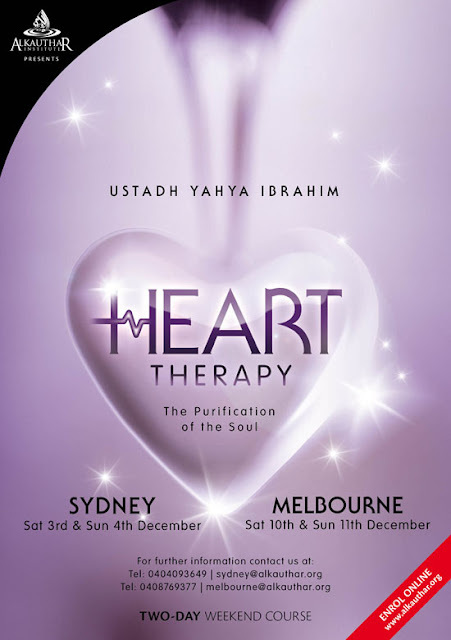 As much as I enjoyed having my own bake stall at Melbourne Madinah, I've decided that with the oven that I currently have at the moment, it wouldn't be such a good idea to start a business from home. Not only is it an old gas oven, it's also not very practical. I might consider getting a small commercial electric oven but for the time being, I'm happy doing small events like this. 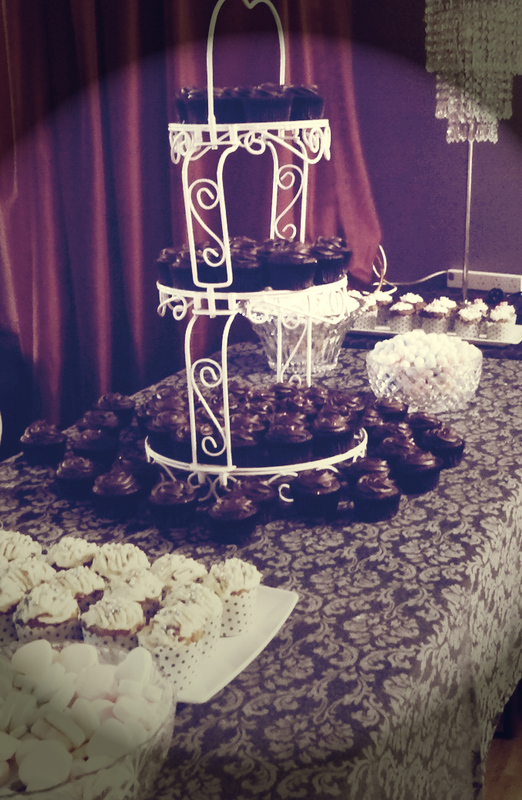 Maybe one day I will open my own cupcake bakery and cafe, but that's sometime in the future, insha'Allah. For those who missed out, you can try making these cupcakes yourself. 1. Preheat oven to 180C/160C Fan Forced. Line 18 holes of two 12-hole muffin pans with paper cases. 2. Beat oil, sugar and eggs in a small bowl with a whisk until combined and mixture has slightly thickened. Transfer mixture into a large bowl; stir in carrot, nuts (if using), then sifted dry ingredients. Do not use a mixer. A wooden spoon will suffice. The outcome will change dramatically. 3. Drop 1/4 cup of mixture into cases. Bake about 30 minutes. Stand cakes for 5 minutes before turning top-side up onto wire rack to cool. 1. Sift sugar and set aside. 2. Beat cream cheese and butter on high until creamy. 3. Then, add the sugar in batches. Add maple syrup. Scrape down the sides in between each addition. 2. Beat butter and sugar in small bowl with electric mixer until light and fluffy. Beat in eggs, one at a time. 3. Transfer mixture to large bowl; stir in sifted ingredients, banana, sour cream and milk in two batches. Banana cupcakes straight out of the oven. 3. Then, add the sugar in batches. Add rind and lemon juice. Scrape down the sides in between each addition. Before adding the batter into the cupcake liner, add one Oreo on the bottom. made with vanilla buttercream with crushed oreos. Look out for my next post where I'll share with you the Double Choc Cupcakes recipe, insha'Allah.